Join an ETIA Timber Design Workshop! Are you interested in designing and specifying with timber? The Engineering Training Institute of Australia (ETIA) is hosting Timber Design workshops in Brisbane (2 and 3 April 2019) and Sydney (9 and 10 April 2019). This comprehensive two-day workshop, sponsored by the EWPAA, addresses the engineering behind timber design as well as the requirements of AS1720 – Timber Structures. Wood science, wood exposure and durability, insect attack, moisture and shrinkage of wood will be addressed. The limit state design and analysis process for the various modes of failure (e.g. bending, tension, compression, shear) are explained in relation to dealing with timber. The workshops address in detail the design of connections. Limit state flow charts are used for the design process for both strength limit state, and serviceability states. Various timber products including sawn timber, softwood and hardwood sections, LVL, Glulam and CLT are addressed. Engineered products and their low variability including advantages, disadvantages and recommended uses are explained. Examples where good design ideas coming horribly unstuck due to a lack of basic understanding of timber are shown. All sessions provide worked examples, tutorial exercises and solutions. For more information on course content and how to register, please visit the ETIA website. Enjoying the Parliamentary Friends of Forestry and Forest Products annual dinner in Canberra recently are Dave Gover, CEO, Engineered Wood Products Association of Australasia, John Simon, chair, Forest and Wood Products Australia, Clinton Skeoch, market development manager, Boral Timber, and Stephen Dadd, executive general manager, Boral Timber. 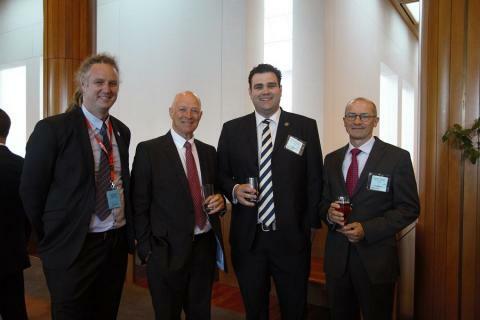 The dinner at Parliament House, a collaboration by AFPA and FWPA, was a ‘sell-out’. 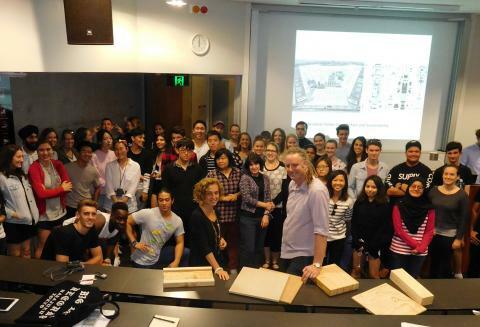 More than 40 UQ architectural students turned up for one of many lectures the EWPAA has scheduled for both masters and second-year classes at universities in Brisbane, Sydney and Melbourne this year. Mr Gover was introduced by Dr Paola Leardini, senior lecturer and technology stream leader at the UQ School of Architecture. The students were asked what they knew about engineered wood, and their knowledge was surprisingly deep considering their early introduction to wood’s capabilities in modern architecture. Durability, versatility, whole life analysis of timber, codes and standards, product availability, construction time, variety of products available, cost comparisons, emissions, design applications – were among points brought up by the students. The UQ’s School of Architecture is a national leader in architectural education and research. It is a research-intensive university and aspires to share its expertise and design intelligence with colleagues in other disciplines, strongly contributing to UQ’s international profile and research standing. Paola Leardini said what was clear from university projects was that many schools of architecture, technical teaching and learning needed a strong advocate – particularly for Australia’s undergraduate architecture students who faced unprecedented competition and rivalling concerns both within and outside the profession. “Students thirsty for knowledge about new, green building products that meet Australian standards for safety and freedom from emissions have such an advocate in the EWPAA’s Dave Gover,” she said. Dave also presented to Masters of Architecture students after an inspection of the School of Architecture’s workshop co-lab. Join an ETIA Timber Design Workshop in Brisbane! Are you interested in designing and specifing with timber? The Engineering Training Institute of Australia (ETIA) is hosting a Timber Design Workshop in Brisbane Monday 22 May and Tuesday 23 May 2017. A recent tour of Chinese plywood mills provided participants with an understanding of the wood resource used in plywood production, manufacturing capabilities, as well as typical plywood products available in the Chinese market. The tour included time in Linyi, known as the ‘wood panel capital’ of China, as well as Shandong Province, north of Shanghai, and Guangxi Province, near the Vietnam border. 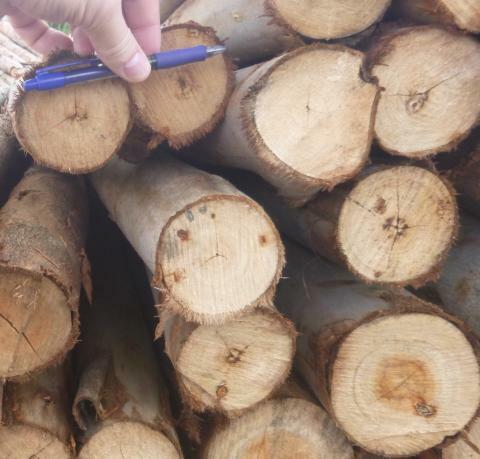 Photo: Small diameter logs in China ready for processing through spindle-less lathes. Of the various plywood mills visited on the tour, the majority were producing an overlaid visual plywood product for furniture, with few mills making a legitimate attempt at producing a formwork product. Pre-priming to reduce the amount of colour variation in the substrate showing through overlays as thin as 0.3 mm was common-place. It appeared that much of the product being manufactured would not comply with AS/NZS 2270, 2271, or 2272 – the Australian and New Zealand standards for interior, exterior and marine plywoods. Australasian plywood producers typically focus intently on issues of veneer moisture and assembly times to ensure a high quality bond, and their manufacturing lines are configured to afford a high level of control of these important variables. It appeared that the Chinese industry relies heavily on air-dried veneer, and factory layouts are considerably more disjointed, Dave Gover observed. These arrangements make it very difficult to control moisture variability which is so critical to reliable bonds. The disjointed manufacturing layouts, significant amounts of manual handling and small log resource result in veneers that are shorter and narrower than the finished plywood sheet. The result is a substrate beneath the overlay that is a patchwork of pieces of veneer. Discontinuous layers create a weakness in the final product, particularly when they align through the thickness of the product. It was clear that workplace health, safety, and environmental regulations are not as rigorous as those governing the Australian industry. Personal protective equipment was rarely worn and there appeared to be a distinct lack of higher order safety strategies, as evidenced by one worker pulling veneer through a guillotine controlled by another – a major amputation risk which would not be accepted in Australian manufacturing. “A level playing field for Australian manufacturers requires policies which recognise fitness for purpose, compliance with product standards, consistent standards for ensuring the safety and welfare of people, and consistent environmental risk management,” Mr Gover said. “Lack of regulation which should prevent furniture grade plywood being represented as formwork plywood, acceptance of material produced in unregulated or unpoliced work environments, and acceptance of material transported on poorly maintained freight fleets does not constitute a level playing field; regardless of where that material is being produced. Poor working conditions in emerging economies undermines manufacturing in more regulated environments, and makes the consumer complicit in condoning work practices that would not be accepted here. “Unfortunately, acceptance of these practices results in legitimate producers everywhere being tarred with the same brush as those who lag far behind in terms of acceptable product and manufacturing practices,” Mr Gover said. “Poor manufacturing creates risk of non-conforming building products being used in applications which demand high reliability, thereby creating serious issues for Australian manufacturers and users. The tour provided great insight into the Chinese plywood industry, including some manufacturing technologies which could benefit Australian industry and major shortcomings in Chinese manufacturers’ ability to meet Australian standards. “The continuous development of competitive forests and technologies, coupled with strong regulatory support for fit-for-purpose products, and recognition of legitimate manufacturing practices, is essential to the ongoing success and competitiveness of forest products and timber construction,” Mr Gover said. 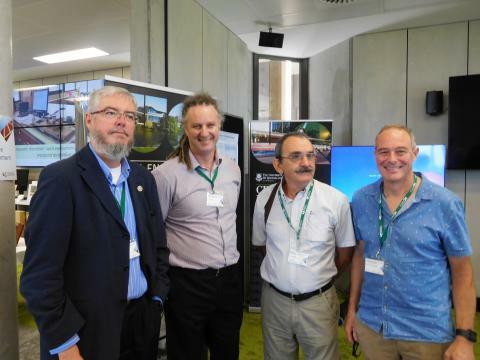 The National Centre for Timber Durability and Design Life, a new group designed to put Australia at the forefront of international best practice, was launched at the University of the Sunshine Coast, November 16. A strategic initiative of Forest and Wood Products Australia, the centre, based at the university, will ensure Australian design guides and standards remain world class in light of climate change, new engineered wood products and changes in building design. EWPAA senior staff Dave Gover, CEO (second from left) and Andy McNaught, technical manager (right), are pictured at the launch with Dr Chris Lafferty, research and development manager, FWPA, Melbourne, and Jack Norton, national secretary, Timber Preservers Association of Australia. The centre was launched by federal Assistant Minister for Agriculture and Water Resources Senator Anne Ruston. Partners in the centre include the University of Queensland and the Queensland Department of Agriculture and Fisheries. State and federal government will contribute funding along with the FWPA and universities. FWPA managing director Ric Sinclair said the centre would create a world-leading predictive model to enable architects and building specifiers to more easily choose the right timber for the right task. “It will be an automated evidence-based tool to accurately predict the structural performance and design life of timber depending where and how it is being used,” he said. “It’s an exciting prospect and it’s one that will be a world’ first’,” he said, putting a five-year time frame on the project. Engineered wood products were on show at the 2016 Timber Design Awards at Luna Park in Sydney in September. The 17th awards organised by the Timber Development Association showcased the use of timber and engineered wood products in designs ranging from community centres, commercial buildings and restaurants to houses and furniture. EWPAA CEO Dave Gover commended the use of engineered wood products in many of the winning designs. “We saw a whole range of products being used in the nominated and winning designs – from plywood and LVL, to glulam and CLT,” Mr Gover said. “The designs really highlighted the versatility of engineered wood products, which is one of the many benefits in choosing these products as a primary construction material,” he said. Mr Gover said it was evident that an increasing number of architects and specifiers are driving the specification and design of buildings using engineered wood products. 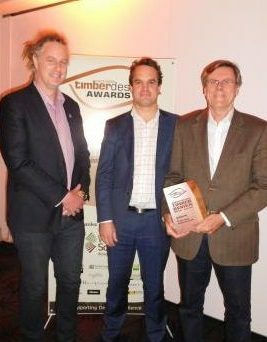 Dave Gover, CEO, Engineered Wood Products Association of Australasia (left), presents the EWPAA Timer Panels Award to Colin Odbert and Ross Styles of Architectus for the The Gipson Commons, St Michael’s Grammar School, St Kilda, Melbourne, at the 2016 Timber Design Awards in Sydney. He said that due to a heightened awareness of climate change and carbon emissions, wood stood apart as a renewable construction material with a better-than-zero carbon footprint. As the seventh most forested nation on earth, it makes good sense, both economically and environmentally, for Australian buildings to be constructed from wood. The EWPAA was the proud sponsor of the Timber Panels Award, which was won this year by Architectus Group for its design of The Gipson Commons at St Michael’s Grammar School in St Kilda, Melbourne. The award was accepted by Ross Styles and Colin Odbert, director and principal at the Sydney studio of Architectus, on behalf of their Melbourne office. The Timber Design Awards judges noted that the Gipson Commons project used plywood wall paneling to promote a calm building environment for the school, through its warmth and sound attenuation. In attendance at the Timber Design Awards were architects, builders, designers and engineers, as well as delegates from various forestry and wood products organisations and industry bodies. The 2016 Plywood and LVL Production Course run by the EWPAA in Rotorua, NZ, last week was deemed a ‘must attend’ event for new recruits in the sector. 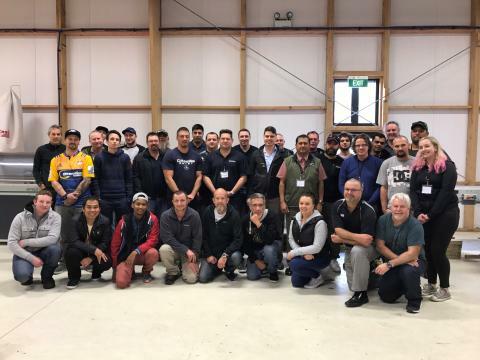 The five-day course, held at the Waipa Campus of Waiariki Institute of Technology, was attended by 30 delegates from across Australia, New Zealand and Fiji and covered all facets of the production processes for both plywood and LVL, including peeling, drying, veneer grading and adhesives. Sessions also included basic structural mechanics, bond evaluation and trouble-shooting, product certification, standards, management systems, quality control and costs, as well as the structural properties of both plywood and LVL. EWPAA CEO Dave Gover said course participants had provided decidedly positive feedback on the course, highlighting its importance to those new to the industry, as a comprehensive overview of plywood and LVL production. The course also included tours to mills and resin development facilities, as well as practical demonstrations and exercises, including chiselling, bond evaluation workshops and strength testing. Australian furniture and joinery makers and designers are collaborating to build a globally-recognised ‘Aussie brand’ image. The catalyst is the current apartment and renovations boom and rising interest in bespoke design. The Furniture Cabinets Joinery Alliance (FCJA) has gained new traction since it was established in 2011, developing a strategic plan supported by multiple industry sectors and recognised by government. FCJA represents a $33 billion industry employing 130,000 people in the manufacture of furniture, in-built cabinets, kitchens, bathrooms, windows, doors and shop and office fittings. Founding members are the Furnishings Industry Association of Australia, the Cabinet Manufacturers and Designers Association, the Australian Window Association, the Australian Shop and Office Fitting Industry Association, and the Australian Woodworking Industry Suppliers Association. 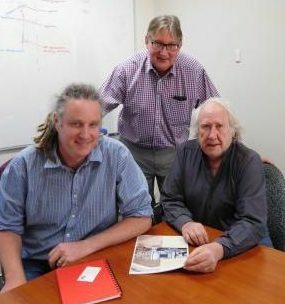 FCJA chair Ron Scott (right) and policy adviser Peter Kreitals (centre) visited the Brisbane office and laboratory of the Engineered Wood Products Association of Australasia recently to update EWPAA CEO Dave Gover on the alliance’s progress as a strong self-advocacy group. The strategic plan aims to ensure the future viability of locally manufactured products, embrace design and innovation as a core characteristic for future growth, maximise share of the domestic market, adopt latest technological developments and attract more highly skilled, highly trained workers. Ron Scott said through a single, united voice, the FCJA has fostered strong engagement with federal and state governments, sturdily advocating its principles through a round of meetings with federal ministers, parliamentary secretaries, ministerial advisers and government officials. “Collaboration across industries also simplifies the fit-out process for customers,” he said. “In this sector of the market there is a lot of activity in home renovation, but less of a desire by consumers to have multiple individual sub-trades to manage. Mr Scott said FCJA was also keen to contribute in a united way to standards and certification processes, drawing on the knowledge, experience and requirements of members. Wood testing and certification services provided by the Engineered Wood Products Association of Australasia are of the highest standard, CEO Dave Gover says. EWPAA-certified products are tested under strict National Association of Testing Authorities (NATA) accreditation rules and manufacturing processes are audited under a Joint Accreditation System of Australia and New Zealand (JASANZ), an accredited product certification program that not all products can claim. “The EWPAA is proud to offer a Type 5 certification scheme, which is the most comprehensive in the industry,” Mr Gover said. 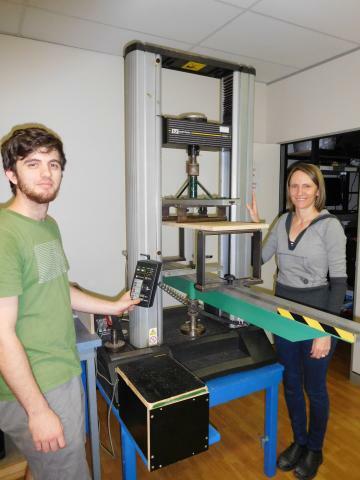 EWPAA laboratory manager Suzie Steiger monitors an Instron machine used for testing the bending strength and stiffness of plywood, particleboard and MDF samples at the Eagle Farm laboratory in Brisbane while new recruit Troy Edwards adjusts calculations on the machine. EWPAA-certified manufacturers of plywood, LVL, MDF, particleboard, and structural timber carry out audits constantly and their products are independently tested on a regular basis. “These monitoring activities are what make EWPAA certification so robust,” Mr Gover said. EWPAA’s Brisbane laboratory at Eagle Farm is accredited by NATA and tests EWPAA certified products for a full range of structural and physical properties and for formaldehyde emissions and bond quality. The association also operates a JAS-ANZ accredited chain-of-custody program for sustainably sourced timber. “Through manufacturing innovation, robust quality control and conformance to Australasian product standards, the wood products industry is committed to providing a reliable, sustainable, and renewable material for building construction,” Mr Gover said. Mr Gover said structural safety and the health and wellbeing of building occupants must be the priority. The EWPAA brand was a mark of confidence that a timber product met the requirements of Australasian standards. The EWPAA and its members have been long-time advocates of product conformance and honest branding. “Promotion of EWPAA certification to the designer and construction community is fundamental in controlling this risk,” Mr Gover said.